My father after eating his share of CB said that Chhole reminded him of the good old times - when their was no soda (read chemicals) used, oils were kept to minimal and Chhole were intensely darkened and spiced. Just the way they were made in weddings when they came in as a fancy food item 35-40 years ago - probably the way Chhole were made in his own wedding. Went to Anil Chhole Bhature Waala or Pandit Jee Chhole Bhature in Kanti Nagar of East Delhi. The shop is known to start the show at 6:30 AM and on most days they wrap up the business by 1 pm, however Sundays see the things change to a different level - sometimes you will find them washing their pots and vessels at 10 am itself. 10 AM is the time when people are starting to wake on a sunday morning and here is this food outlet that is already done for the day by that time. Marvellous. A line of 20-30 people is not unusual at the shop and in busy hours the queue can grow manifold. Infact on Sunday they do not serve the food in plate, the only option is to take away. However you can still see loads of people eating from takeaway packets in their cars and on seats of their bikes. Reached their at 8:15 am and after transcending the usual 20 people like got our packet. 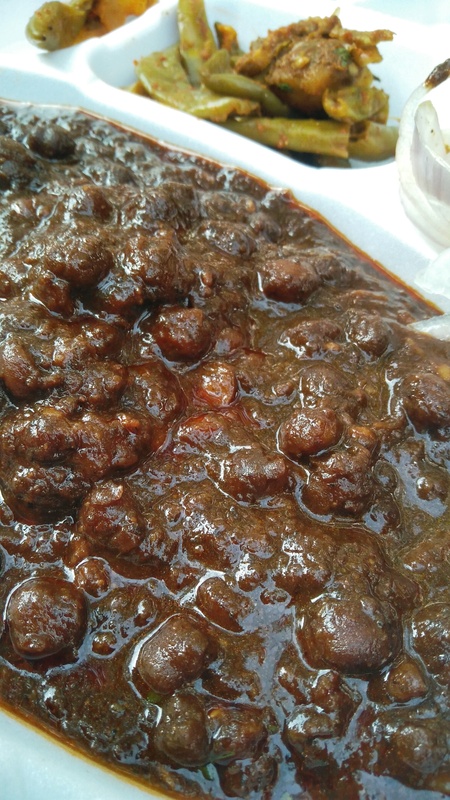 Intensely spicy and dark chhole with soft and squishy Bhature - not very fluffy, but melt in mouth - perfect to handle the kick that chhole have in them. Now the interesting part - the green chilly served in the pickle is not hot but sweet - unlike traditional indian pickles done in spices and oil, this was done in vinegar. Also came on the sides of a mix of potatoes and ginger - which again is a priced condiment there, as people who got their order 8:30 AM, told us that by that time the shop had run out of aloo-ginger combo - making it much sought after object of desire. It is said they mix 'Afeem' or opiates in the food - a rumour that is a mark of honour for any thriving food outlet - which just means that the food is soo good that you will get addicted to it. Wanting to eat it again.. and again. Shashank Aggarwal Vikas Bhai.. I just put kanti Nagar on google maps and once I was there I asked for this Bhature waala. very popular out there.